BMW has been showing off its latest self-driving car technology at the CES show in Las Vegas. Both high performance and more mundane self-parking tech is on the menu and some of it will be available on BMWs you can buy this year. The stuff you'll be able to option soon is the self-parking feature, which comes to the BMW i3 electric car first. We've experienced plenty of automated parking features on production cars before. Indeed, BMW has its own system on several existing models. The difference with this latest demo is the full push-to-park automation. The driver need touch neither steering wheel nor pedals. Just enable the parking feature, allow the car to detect the space, hit a button to get things rolling and the car does the rest. BMW says the system can squeeze the i3 into a space just 22 inches longer than the vehicle itself, which would be a challenge for even the most deft human parking aficionados. The only slight snag is that the system needs a well defined kerb to operate with full accuracy. So, your mileage will vary in the real world. The feature will be made available on the i3 electric car first and then rolled out across further BMW models. 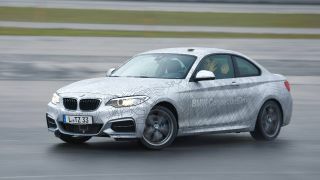 As for the performance angle, BMW has also been showcasing an automated 6 Series and 2 Series models performing various acts of on-track robotic derring do including slicing through a wet corner, a slalom and s-turns at serious speeds. The idea here is to show just how dynamic self driving cars can be, something BMW is keener than most to prove given its long-time tagline of Ultimate Driving Machine. While we're sure it's an impressive thing to experience, there's a huge difference between a tech demo like this and commercially available self-driving technology. Likewise, these sorts of high speed on-track larks aren't really the problem for autonomous cars. No, the real challenge is negotiating the hugely varied network of roads and byways in the real world, infest with errant human drivers, pedestrians and more. The other major sticking point is less to do with the tech and more to do with acceptance. Both public attitudes and legislation needs to adjust to the prospect of robotic cars.